First Bus drivers were ranked first, second and third in the finals of the Bus Driver of the Year 2014 competition held at Blackpool recently. The ‘clean sweep’ is thought to be the first of its kind in the competition’s 48 year history. Around 120 drivers from across the UK competed in the event. Winning the ‘Bus Driver of the Year’ accolade was First Aberdeen driver, Jonathan Welch. He was competing in the finals for a second time, having finished 22nd in 2012. For his win, Jonathan picked up the Coventry Trophy, The Road Operators Safety Council Award, The Unite Trophy and The John Boxall Medallion, as well as a holiday in London and prize money totalling £2,050. Finishing in second place was First Cymru driver, Peter Mascall, winning him the Compak Trophy and the Rail, Maritime and Transport Workers Union trophy. 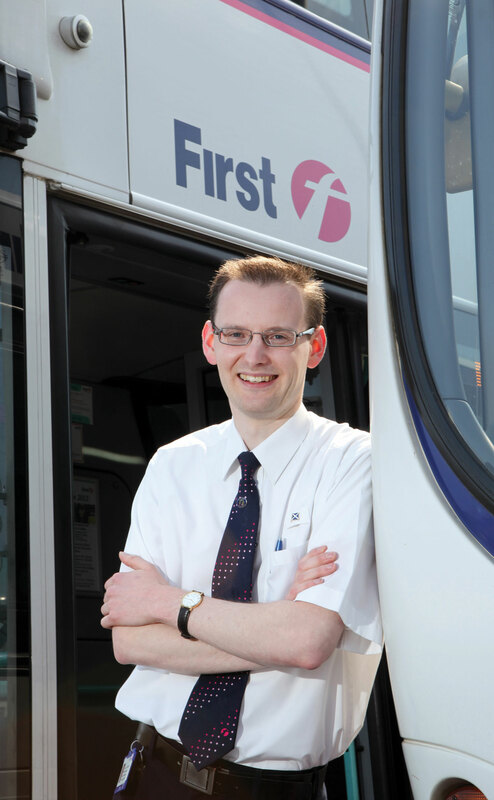 Phil McAvoy from First in Devon and Cornwall finished third, winning him the Volvo Bus and Coach Cup and the Best Impressions Trophy. In fourth place was Daniel Wilton of Stagecoach Manchester (Voyager Alliance Cup) and fifth was James Staggs of Go-Ahead London (Vix Technology Trophy and the McKenna Shield). First Aberdeen won the Company Award, winning the Brian Evans Memorial Trophy. The Vice President’s Cup for the best presented bus in use at the final went jointly to Arriva North West and Wales and Rossendale Transport. (The Wrightbus Shield) went to Philip Connor from First Cymru; Best Highway Code Test Result (The Wrightbus Shield) was awarded to First Cymru’s Peter Mascall; the Highest-placed competitor from an ALBUM member (The ALBUM Trophy) was Scott Crosbie of Lothian Buses; and the highest placed competitor from an independent company (The Wrightbus Trophy) was Tomasz Jageiłło from McGill’s Bus Services. The highest-placed Arriva competitor (The Arriva Trophy) was Arriva Yorkshire’s Andrew Sykes; the second highest placed Arriva competitor was Michael Todd of Arriva North East; the highest placed FirstGroup competitor was (The FirstGroup Trophy) Jonathan Welch from First Aberdeen; the second highest placed FirstGroup competitor was First Cymru’s Peter Mascall; the highest placed Go-Ahead Group competitor (The Go-Ahead Trophy) was James Staggs of Go-Ahead London; the second highest placed Go-Ahead Group competitor was Darrell Hadland from Southern Vectis; the highest placed London Buses competitor was Go-Ahead London’s James Staggs; the second highest placed London Buses competitor (The London Buses Shield) was James Monk from Stagecoach London; National Express West Midlands’ Craig Lockyer was named the highest placed National Express competitor (The National Express Trophy); second highest placed National Express competitor (The National Express Plaque) was Bob Green of National Express West Midlands; Daniel Wilton of Stagecoach Manchester was the highest placed Stagecoach competitor (Stagecoach Trophy); and the second highest placed Stagecoach competitor (Stagecoach Shield) was Thomas Grant from Stagecoach Midlands.